The Chief Minister visited a village under Ekma block of the district where he flagged off as many as 331 projects involving a total cost of Rs 416 crore, an official release said here. 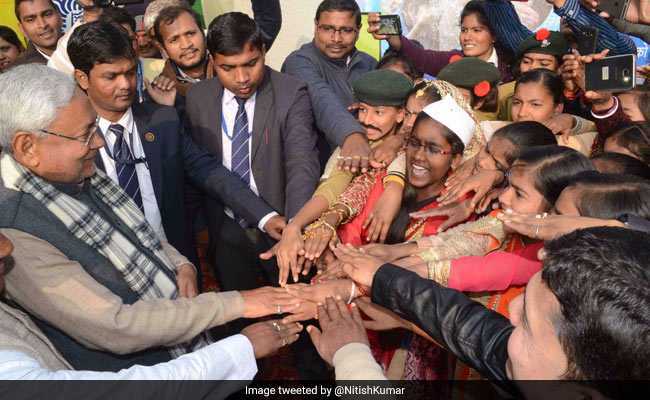 Patna: Bihar Chief Minister Nitish Kumar today conducted a tour of Saran district as part of his Vikash Samiksha Yatra where he inaugurated and laid foundation stones for more than 300 projects worth over Rs 400 crore. Addressing a public meeting on the occasion, Mr Kumar spoke about his government's campaign against social evils like dowry and child marriage, saying "these efforts must not be viewed through the prism of politics". "It should be a matter of concern for us that while Bihar occupies 22nd rank in the country when it comes to overall incidents of crime, the state is behind only Uttar Pradesh in cases of dowry deaths and harassment", he said. Urging the people to enthusiastically take part in the state-wide human chain which will be formed on Sunday, January 21, to send across a message against the aforementioned social evils, the Chief Minister said "you must also socially boycott all those who take dowry, even if they happen to be your near and dear ones". Speaking about the ban on sale and consumption of alcohol across the state, Mr Kumar said "we took the bold step on April 01, 2016 following a strong demand from women". "The women now have an important role to play in ensuring that the legislative measure achieves the desired outcome. We are doing our bit and taking steps like creation of the post of Inspector General of Police (Prohibition) for more effective enforcement", the Chief Minister said. "But the women must also rise to the occasion and point out to male members in their families the dangers of consuming liquor that is being brought and sold in the state illegally. They can do so citing examples of recent hooch tragedies in Rohtas and Vaishali districts", he added.